The Elves at Bunkers Hill have finished working their magic on the nursery! Help yourself to a free mug of hot chocolate and take a tour through our enchanting Christmas Tree forest, lit up by thousands of Christmas lights. 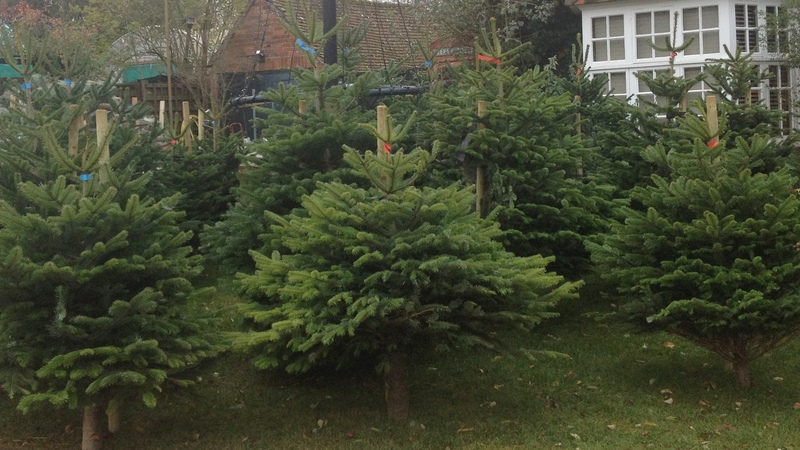 There are hundreds of beautiful English grown trees to choose from and each one is unique. We've got smart Norway Spruces with their rich green needles and delicious spruce scent as well as gorgeous bushy Nordmanns with their blue hued foliage, all with plenty of room for tinsel, lights and home-made decorations. Why fake it when you can have real festive foliage? Adorn your front door with our hand made wreaths (starting at £9.50), and deck your halls with holly branches and mistletoe sprigs. All much cheaper than you'll find in the big chain garden centres! Take a whirl on our Wheel of Fortune by the kiosk to see if you can win one of our star prizes! It's only £1 for 3 spins and all proceeds go to charity. This year's Reindeer Challenge is now on! Santa needs your children's help to track down Rudolf and all his other work shy reindeer so presents can be delivered on time. Keep your eyes peeled for antlers in the shrub beds and listen out for jingly bells among the Christmas Trees! Entry is just 50p and all proceeds go to charity. BBOWT was founded in 1959 by local ecologists who could see the extent of harm being done to the wonderfully rich natural environment of the three counties. For more than 55 years they have worked with local people to make Berkshire, Buckinghamshire and Oxfordshire richer in wildlife.